Ingress and egress are merely the beginning….. Doors open both ways – allowing us in, and out. They invite, block, contain, and permit emergence. You may be welcome, or not. You may be drawn in, or unimpressed. But sooner or later, you will pass through. But the implicit meaning remains the same, and this particular gate(way) below is the best example I was able to find. Here, the materials of the gateway are all natural, but their components hold a subtle warning. If you are unable to guess the nature and substance of the warning, I strongly suggest you not enter within!! 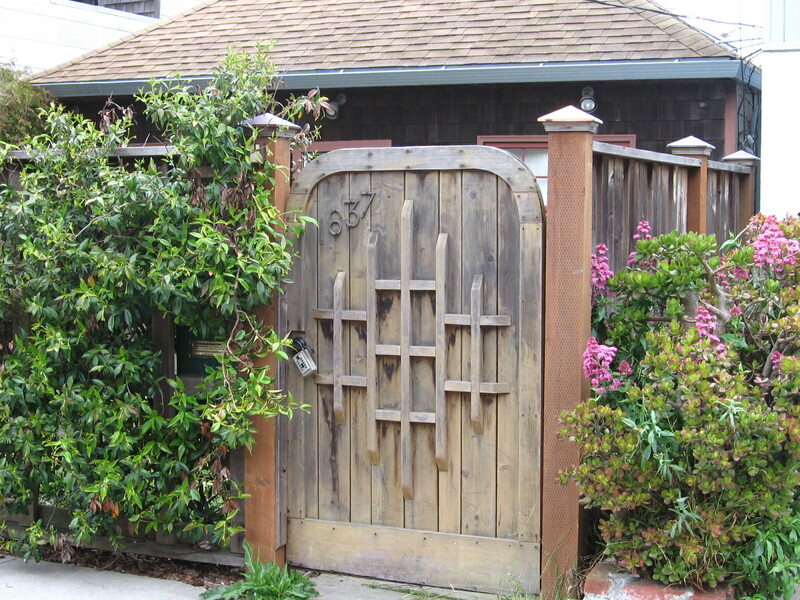 Be pure of heart, else enter not..
Now, this is not a front gate proper, as it allows entry to a driveway, but it is the more common point of entry to most homes in Southern California. I mean, who the hell walks anywhere in Southern California? You would either get run over, or die of dehydration before you got a mile from home! Best to take the wheels. As we humans began migrating to the cities over the past few hundred years, the front gate has nearly vanished in some places, at best to be replaced with security gates. Apartment and condominium developments require us to get “buzzed in.” In high-rise condos, there are often security guards. Our privacy has seemingly trumped neighborliness. We seem to approach every encounter with distrust as the default, rather than openness and trust. This is, in my view, the great failure of modernism, despite all the reasons that are put forth to defend these changes – more nut-jobs, more criminals, etc. But this seems like a chicken/egg argument to me – when we respond to a negative force with opposing negative force, we paint ourselves into a corner. Criminals just up the ante, and then we respond in kind. Pretty soon, it seems madness to not do so. I work in a field where I have to knock on doors a lot. Often, this occurs in some rather dicey neighborhoods, but just as often, in more up-scale burbs, and I have come to find this type of distrust and fear rampant in both places. It is just a little better disguised in the up-scale communities, hidden behind better security, and never mentioned out loud. But once in a while, I get to visit small towns, where crime is far less an issue, and where neighborliness remains an art practiced by most local citizens. Even where there is no front gate, there is less suspicion when someone opens the door to ask what they can do for me, rather than asking what I want. A distinct lesson in the message conveyed by word choice! I am always curious – what do people want visitors to their homes to experience, from that first moment – approaching the home? Do they want people to feel welcome, or not so much? Are they hoping to impress with their wealth, or with their esthetic? Are they saying please get to your business and be on your way, or, hey, care for some lemonade? How we present our facade is exactly the same as how we choose to dress – it conveys something about who we are, how we act, what we respect. 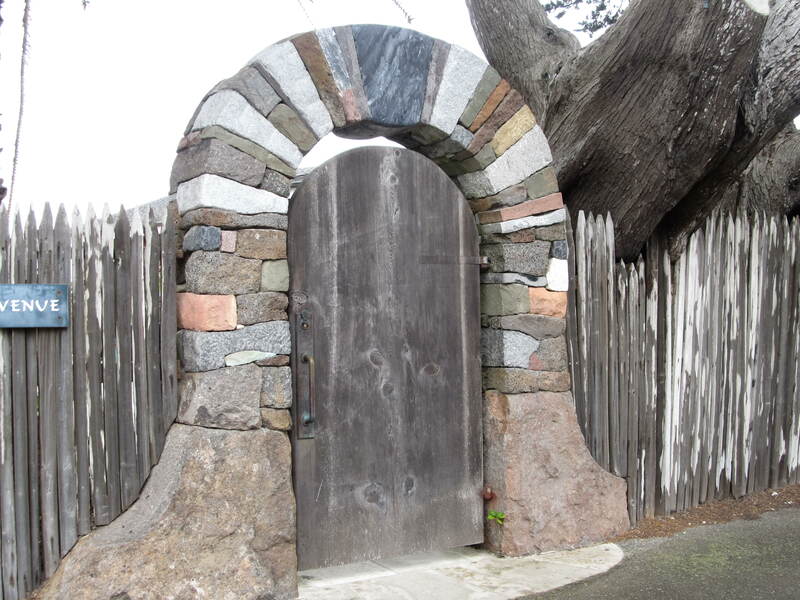 A front gate may not be how you wish to spend time expressing these things, but the gate contributes to those elements of communication despite our own intent. Here is a chance to think about that. But do consider sitting on the front porch and having a cold drink while doing so!! Gates, as I have mentioned prior, are both a physical thing, and a metaphoric process, if you will. Each person can be, (though not all will be) a gate for others, a doorway to newer understanding, deeper resonances with the Universe. We open gates within ourselves, and serve to open gates for others, often never knowing we have done so. Some of these gates we open lead to good outcomes; others fall considerably short. I think of spiritual guides as a kind of gateway, but I find that those without such intent, who nonetheless still open those gates for others, to be far more compelling. Perhaps it is the unplanned, unintentional aspect of these gates that intrigue me the most, I haven’t fully sorted it out yet. But many of us have met people who open their gates for us, just because that is who these people are. Welcome, they say, without words. Just with the sureness of their hearts. Who knows what lies beyond? The world is a complicated mess, which is where most of its charm comes from, if you think about it. Sure, there is all the out-front stuff – politics being the dominant mess of the day – but there are also myriad hidden gems, people and places that can only be stumbled upon, and in that moment of taking the stumble, we get to for a brief moment remember that life is much more than the usual, the planned, the to-be-expected. My dearest and I had one such of those unexpected encounters yesterday, when we ran into an amazing man, with an even more amazing hobby/business/avocation. Myanmar, or as some still call it, Burma, has been in the news often because of it’s political repression by a military dictatorship, and more recently, for what on the surface at least appears to be a slowly changing situation for the better. What most in the West do NOT know about Myanmar is that the people keep trying to live decent, spirit-filled lives, often led by the Buddhist monks who have been a dominant social force in the country for centuries. Their monasteries abound throughout the country, and these monasteries are storehouses of both spiritual knowledge, and the essentials of the ancient and honorable Burmese culture as a whole, including the arts. Nowhere is this more apparent than in the architecture of the monasteries themselves. This is the work of one David Van Leeuwen, and much more of his work can be seen at http://www.davidjaap.com, and I strongly urge you to visit his site. The gateway below is called the Lotus Flower Gateway, and is a copy of a 200-year-old monastery in Mandalay. He makes his gateways and other Burmese sculptures by taking rubber molds from actual wood carvings, and then pours them with reinforced concrete mortar, some with pigmentation added, and some with paint. He sells his sculptures and gateways as a way to raise funds to help build schools, water wells, and other community improvement projects in the small villages of Burma/Myanmar. 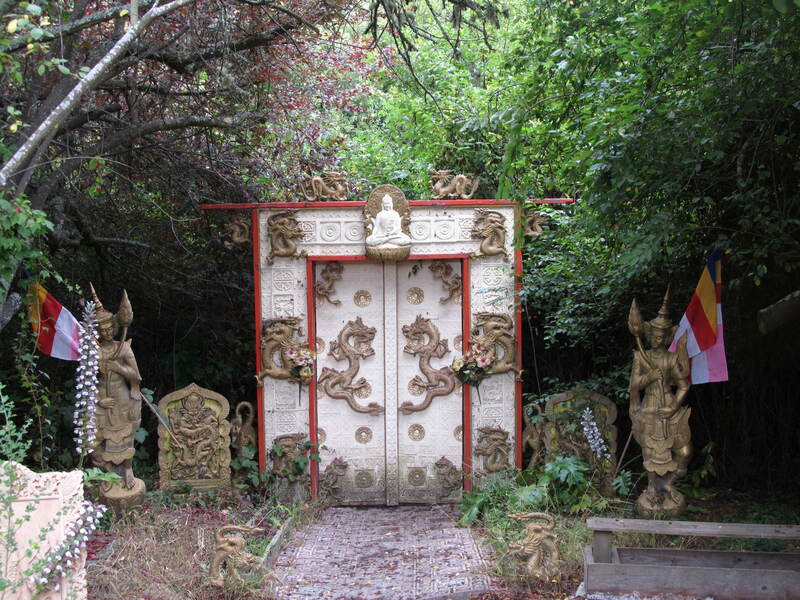 This copy of a gateway from a 200-year-old monastery sits among giant eucalyptus trees a world away from Myanmar. Does the dragon matter entering, or exiting through the gateway? And how will you change? David is truly the embodiment of a world-changing artist, and I hope you take the time to get to know about him, and the amazing work he is doing to change it, one village at a time!! Come on, step through the Dragon’s Gate!! Just click on it, and you will be instantly transported. How cool is that!!?? Gates and fences, as has been said, and as is quite obvious, started and often remain an element directed at security. The idea of keeping people out, except those the property-owner desires to enter, goes back to the very first fences, walls, and gates. But security comes in many colors, not the least of which is the idea of community. We would be correct to assume that physical security measures pre-date the security imposed by laws and the penalties that attach to their violation. But law, and the resultant cultures that are shaped by laws, have slowly, and in fits and starts, altered community itself, and all it implies and imparts. Criminal acts will, sadly, be with us forever. But the numbers and nature of such acts have in some places diminished with time, and in other places shifted locations of greatest impact. Rural settings have markedly different crime rates as well as crime types. Cities also differ from each other based on a myriad of local factors – climate, local law and law enforcement efforts; cultural pressures; and most of all, community involvement. The more involved the community members are with life in their community, especially outside their own homes, where their physical visibility, and the visibility of their interactions with their neighbors, the less likely their neighborhood will be targeted by criminal elements. 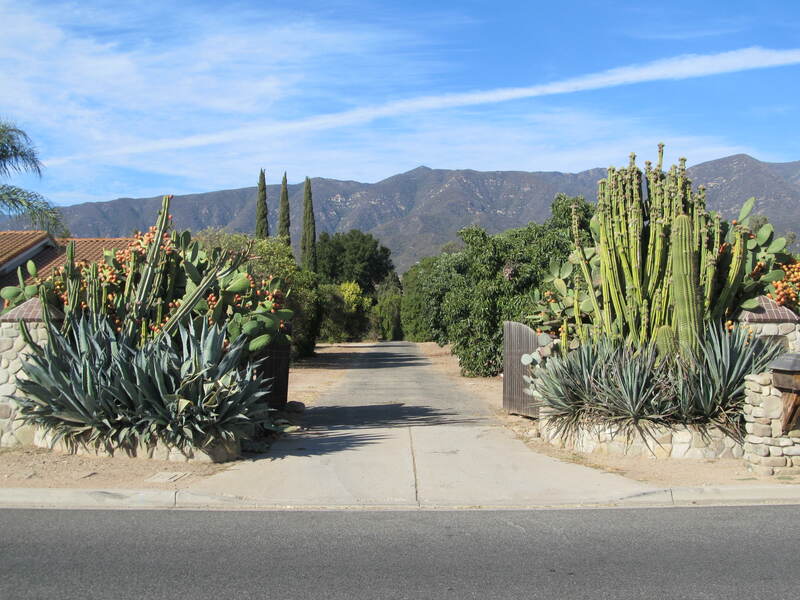 It is within such neighborhoods that the nature of fences and gates change from pure physical barriers and access controls, to architectural complements to the home enclosed by them. This sort of change might seem subtle, but only due to how these elements support each others esthetics. Instead of relying on pure physical impermeability as their deterrence value, they rely on the historic mental image of a fence and gate as an unconscious reminder. 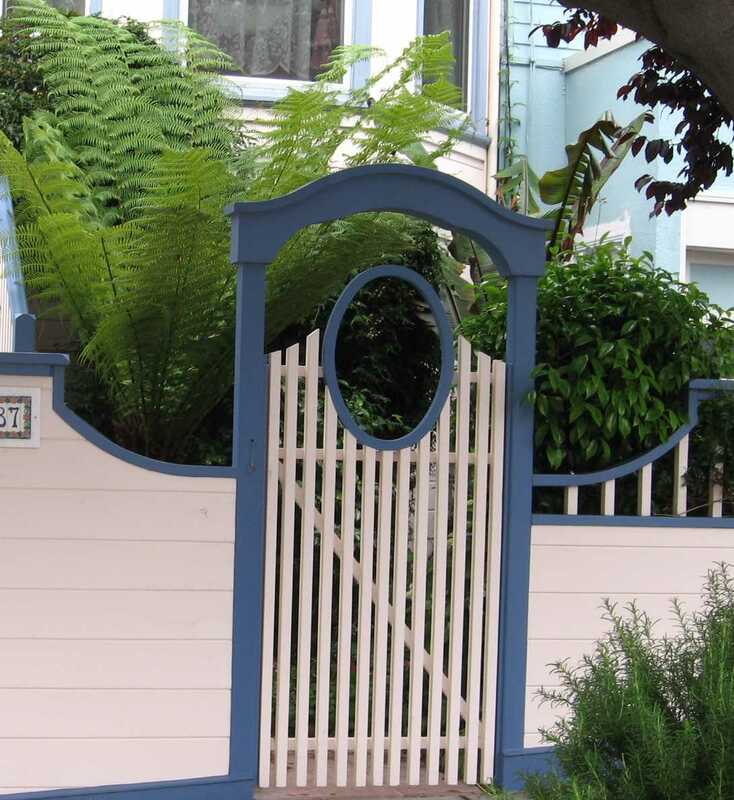 Such fences and gates tell the passer-by to respect the property limits, while also relying on the pleasure of seeing an esthetically balanced view to engage that same passer-by in a different perspective – one of community, of neighborhood, of friendly people and places. By effecting a change in mind-set, one also reinforces the lowering of criminal intent by replacing it with a sense of belonging. Now, certainly this does not mean a total reduction in criminal behavior – the human species will always have its ner-do-well’s and miscreants. But these more subtle contributors to better security should not be under-valued: they represent a slow but historic shift in the evolution of communities. So the next time you take a walk in the neighborhood, look at the fences and gates around the streets you are walking. Note how each either works esthetically with their house, or does not. Ask what the homeowner might have been thinking about, and how that might say something about how they view and interact with their own neighbors. Then, go home, and look at your own gate and fence. What are YOU communicating? How would you change it? And, why? Fresh lemon-aid, here, come on inside the gate! Is It A Door, or Is It A Gate? So, when is a door actually a gate, or vice-versa? The answer is really quite simple, but then, maybe not. It is a door if it leads to an interior space, but a gate if it encloses an outer perimeter that contains the dwelling or building where the interior space is, well, interior. But (of course there’s a “but” though usually to a joke) a gate can double as a door. Those gates that enclose large and often ceremonial or other types of public buildings, like museums, churches, mosques, synagogues, as a few examples. While they function as a door, they hold a more metaphoric position as a gate, because the interiority is itself dual – it is physically interior, and it is psychically or spiritually interior. This gives such entry and exit-ways a purpose that other gates, while it may be implied they possess, cannot prove it so. Just a little to think about today! property, livestock ( a form of property), dwellings; towns, institutions, cities, babies, dogs, prisoners, students, wealth, undesirables, desirables, spiritual strivings, knowledge…..
Those with permission, those who are invited, those who have control, those who claim, those who desire, those with the key, those who solve the riddle, those of pure heart…. A gate does not know its own purpose. Because it IS its purpose, and thus, has no need to know. Welcome to the start of the Front Gate Project, a blog where you, the reader, can help create a place for both sides of the front gate, whether you are leaving through that gate, or coming inside, perhaps for a spot of tea. Gates, after all, are nearly-universal. They are means of egress and ingress, they define boundaries, keep the riff-raff out and the livestock in, protect the people inside and hold the world at bay. They are a bow-tie for fences, and make fences do their jobs properly. But beyond utility, gates frame the experience of arriving and leave-taking, and can often spell the experience one may anticipate upon entering. And furthermore, they often possess great looks! 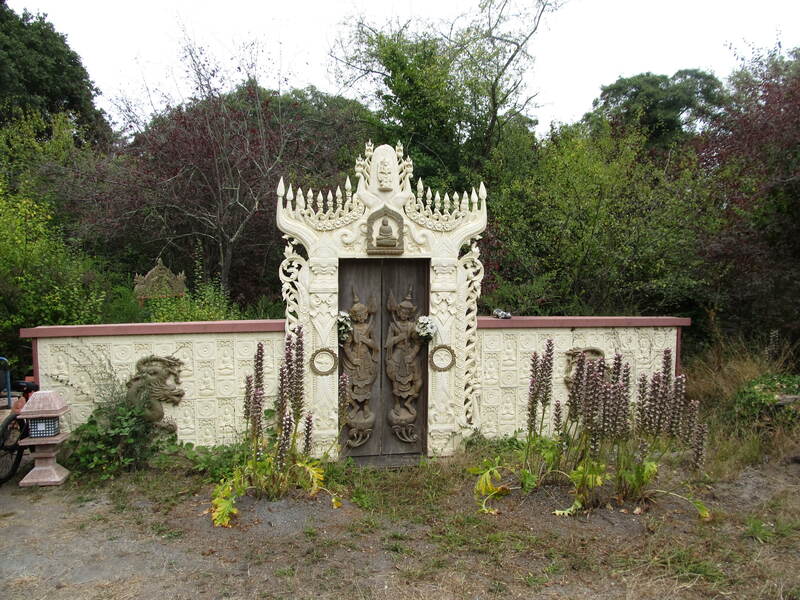 So this is a place to talk about gates, share photos of interesting, artistic, bizarre, and creative gates, and share stories of how gates have affected your life. So, why not open the front gate, and step up here on the veranda. I just finished making a nice pitcher of iced tea – care for some? The tall gate, the high gate, good for keeping in the high jumpers and keeping out the low lifers all at once! How Can A Gate Work On A Globe? End of the World As We Know It – and about time, too! There are bumps on the road in every journey, but don't fear them – embrace them! This project depends on you - and your photos of gates. Great gates, different gates, unusual gates, non-obvious gates. Be sure to include your contact information, permission to use your photo, and a name for proper credit where credit is due! Be a part of the Gate Project.